The Boeing E-6 Mercury is an airborne command post and communications relay based on the Boeing 707-320 airframe. The original E-6A manufactured by Boeing Integrated Defense Systems entered service with the US Navy in July 1989, replacing the EC-130Q. It conveyed instructions from the National Command Authority to fleet ballistic missile submarines, a mission known as TACAMO ("Take Charge and Move Out"). The E-6B model deployed in October 1998 kept this role, but added further command post capabilities and control of land-based missiles and nuclear-armed bombers. 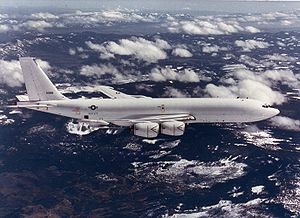 The E-6B replaced Air Force EC-135C's in the "Looking Glass" role, providing command and control of U.S. nuclear forces should ground-based control become inoperable. 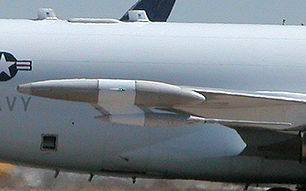 Like the E-3 Sentry AWACS, the E-6 Mercury is adapted from Boeing's 707-320 commercial airliner. Only one version of the E-6 currently exists, the E-6B. The E-6B is an upgraded version of the E-6A that now includes a battlestaff area and new flight deck systems replacing the aging 1970s-style cockpit with an off-the-shelf 737 Next Generation cockpit. This greatly increases the situational awareness of the pilot and saves significant cost over a custom avionics package. The first E-6A was accepted by the US Navy in August 1989, sixteen were delivered up to 1992. 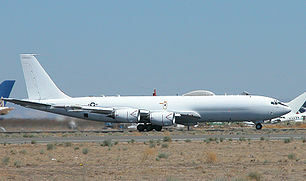 The first E-6B was accepted in December 1997 and the entire E-6 fleet was modified to the E-6B standard, with the final delivery taking place on 1 December 2006. Codenamed Looking Glass, it is USSTRATCOM's Airborne Command Post, designed to take over in case the Global Operations Center (GOC), located at Offutt Air Force Base in Nebraska, is destroyed or incapable of communicating with strategic forces. The term 'looking glass' is used because it "mirrors" the abilities of the GOC to control nuclear forces.